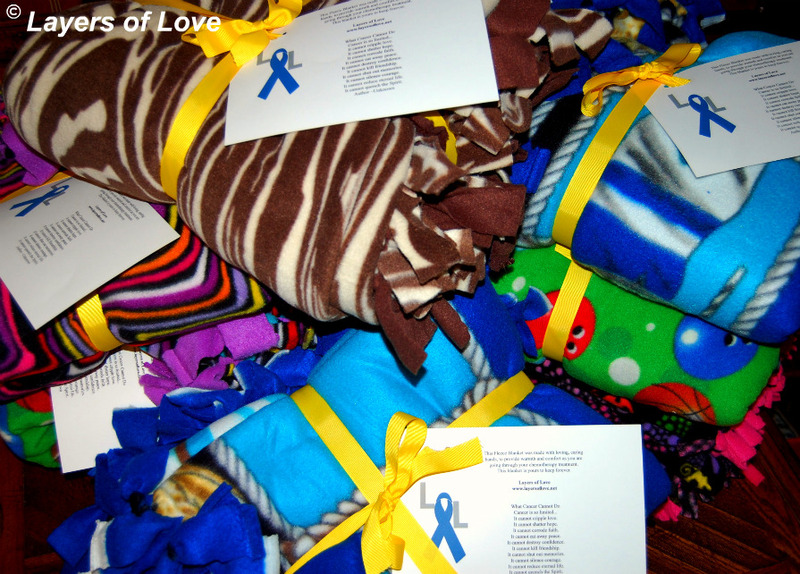 Over the past two years Layers of Love has donated a great many fleece blankets to many chemotherapy patients. Sometimes when a patient receives a blanket we will receive a photograph of them smiling with their blanket. That got us to thinking. We would love to hear from you if you or a loved one has received a blanket from us. If you have a photograph you’d like to share that would be great too! We would like to share your story with our friends here on our blog and on our facebook community page. We want your story to be told. Every blanket that we ship out goes to a unique patient with a unique story. I am always amazed when I personally hand out our donated blankets by all the stories the patients tell me about themselves. These are all beautiful stories. They tell me about their life, their battle with this terrible disease, and their families and all the support they receive. These are all stories that should be told, voices that should be heard. If you or your loved one would like to featured here on our blog and on our facebook community page please contact us at patty@layersoflove.net We look forward to hearing from you! None of our donations chemotherapy patients both adult and pediatric would be possible without the generous donations of people like you. We are very grateful because without you we wouldn’t be able to do what we do. If you have a fleece fabric you would like to donate, you can contact us here in the comments or at: patty@layersoflove.net We accept brand new fleece fabric and no sew fleece fabric kits (available at many craft stores). Don’t have the time or not sure how to put a kit together? No problem, we can put the kits and fabric donations together for you. Not sure about sizing or measurements? We invite you to take a moment to look at our FAQ tab and Guidelines tab above this post to see our recommendations for donating child-sized blankets. This entry was posted in Adult Cancer Patients, Chemotherapy Patients, Donations, Pediatric Cancer Patients and tagged blankets, cancer, chemotherapy, comfort, Donations, fleece, patients, stories, support, warmth. Bookmark the permalink.